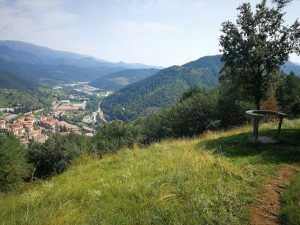 In Ripoll you can choose from a variety of mountain bike routes, all of them with different technical difficulties, which you can enjoy with your family or friends. The MTB routes will take you to discover the whole environment of the town, crossing torrents, pine forests and lush beech forests, reviewing the culture and history of the cradle of Catalonia. Ideal route to enjoy with children, mostly by sections of cement roads, without any technical difficulty. We can do it throughout the year, avoiding especially in summer the central hours of the day, this is a circuit with little shade. 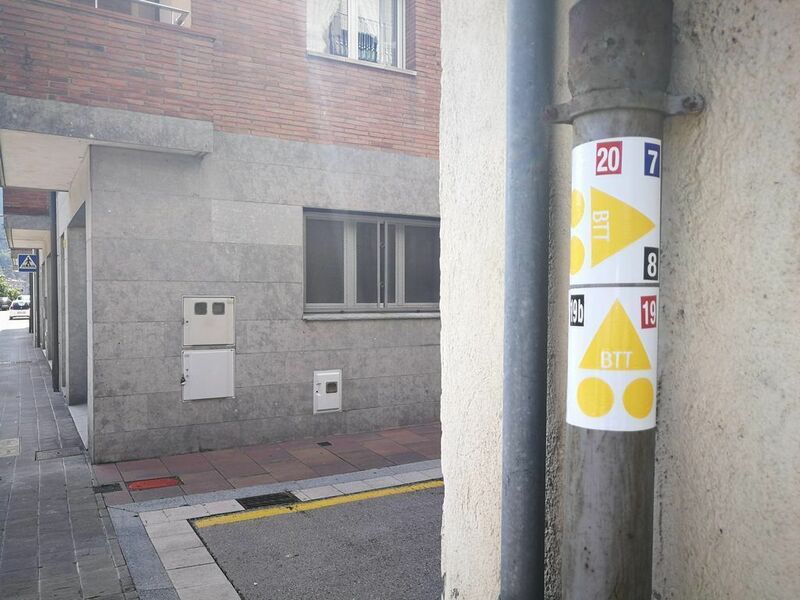 We will start the route in front of the Avellaneda Technification Center, direction to the town, which we will cross by the Passeig de l’Estació and we will look for the bike path that will lead us to Can Villaura, where we will find a signpost and we will cross the road under a bridge. We will find the parking of the restaurant, and we will go to the road of Les Llosses, although it is a secondary road little traveled, we will advance with caution until we find on our right the entrance of a road with a sign that already indicates the way to continue towards the hermitage. This section, where we will pass through some farms, will be uphill until we find a crossroads, also signposted, where we will turn right and leave the cement to enter a dirt track, in very good condition, which will lead us to the Ermita del Remei , where we can rest in the shade of the trees. We will continue along the dirt track, always in a gentle descent, that will take us to the final stretch of land, and we will enter the streets of the town through the Engordans Urbanization, where we will find a fountain of the same name, and that will lead us, after crossing the road, the Passeig de l’Estació and on a path enabled for the passage of the bicycles next to the Ter River, we will return to the starting point. The ideal time to travel is from spring to autumn. In winter, in addition to the cold, we can find snow on the highest points of the route. It is a tour mostly by track or good cycling roads, with some short technical stretches. In addition to the GPS, we can follow the plates of the “Centre BTT Ripollès” marked with the number 19 (red color). We will start the tour in the Pavelló de l’Avellaneda, and cross the town on the road, towards Barcelona. After the railway station, we will arrive at a traffic light where we will turn left and we will enter the dirt track. Progressively we will go up without difficulties until we find a detour to the right, which after a short descent, will make us climb, inside a sturdy beech forest, to a high voltage tower, where we will turn left and descend a path with some technical stretches to a farmhouse, after which we will return to the forest track, in good condition, which will lead us to cross the train track by an underpass, after which we will climb again, with some section harder than other, that without loss will lead us to pass in front of a fountain, and shortly after we will reach the core of La Serra de Llaés, where, if we want, we can recover strength in the inn. We will leave behind Llaés along a concrete road with a gentle climb. We will see the Castell de Llaés and, on a dirt road, we will arrive at the old Hostal de Llaés, the whole complex currently in ruins. At this point we will start a new descent, with a lot of shade, which with some technical point, will leave us on a concrete track, which we will follow to the right always parallel to the Riera de Vallfogona, we will cross a small cement plant after crossing the stream, and finally we will go to the Vallfogona road. We will carry out, with caution, the short stretch of 100m of road, and then we will return to enter on a dirt road and we will realize the sector where we will find the most demanding climb of the whole route, with steep slope and the ground broken by the rains, that will leave us in a meadow where we will begin the last descent of the day, this time by path with some technical section where we will make use of our technique on wheels. In the last section of the trail we will find a fountain and immediately we will arrive at Mas Rodonella, which will leave us on the Ruta del Ferro. At this point we will turn left, towards Ripoll, and we will make the last few kilometers until we return to the starting point. Recommended route from spring to autumn. In winter, in addition to the cold, we can find frozen areas and punctually with snow on the high levels of the circuit. Mixed route of cement and dirt track, with only one technical zone, very short, in the descent. 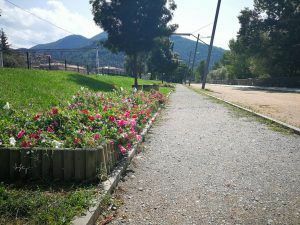 We will start the route in the Pavelló de l’Avellaneda, and we will go to Ripoll on the bike path, we will cross the village by the Passeig de l’Estació until we find again the bike path that this time will lead us to Can Villaura, where we will cross the road by a lower step. We will go to the road of Les Llosses, where, with caution, we will make about 500m until we find a detour to the right, on a cement road, where we will start the ascent, first with a considerable ramp and after by a softer section. Always by cement we will arrive at Mas Mir, a rural house, and just before arriving we will leave the cement to find a dirt track on our right. Without loss or rest, this track will leave us at the highest point of the route, the Catllar antennas. Not going up to the chapel, we will find a wide signposted path that goes to our right, through which we will begin the descent. The first sector is easy, always by a leafy beech forest, until we find a turn to the left and find the only technical sector of the route, short but very damaged by the rain and with steep slope. After this stretch we will arrive at the “3 plans”, where we will find a fountain, and we will continue downhill easily, until we cross the railway track by a lower pass, which will leave us in the leisure area of ​​Font del Tòtil, where we will find another point of water, and by asphalt we will enter the streets of Ripoll that will return us to the initial point. Recommended route from spring to autumn. In winter, in addition to the cold, we can find some frozen or snow areas. Very fun circuit, mostly by footpath, that without leaving Ripoll will allow us to enter its forests. We can also be guided by the signs of circuit nº21 of the Ripollès Mountain Bike Center. We will start the route in front of the Pavelló de l’Avellaneda, and after crossing the Ter river, we will turn right to make the first meters by road, until we find, on the left, a cement track that soon will be dirt road. In this first sector, we already can intuit how will be the rest of the circuit, always on not well defined paths and having to pay attention all the time. We will leave the track to find a cattle pass, which we will cross, and soon we will find another one to our right, where a little defined path will make us cross the torrent and we will follow again by path parallel to the road, until making a turn of 180º to the left, uphill, and after a short stretch of track, we make a right turn to cross a grass and start the ascent by trail and track, according to the section. After constant turns, which will not let us mantain a good rhythm at any time, we will arrive by track after a strong climb, to the highest point of the route, a hill next to the Turó de l’Adroguer, where we will turn left to begin the descent, in this first section, by forest track. 500m after we will find a path to the left, marked with a stone landmark, which will make us to be very attentive to the descent, with some technical section that according to our skill, will force us to put the foot to floor, and that always downhill, will lead us to Coll de Comallevosa, where we will see in front of us the last ascent of the route, short but intense. Just before getting to the top we will see the marks of PR (green and white) on the left, which will lead us to Sant Roc, one of the best viewpoints of Ripoll, and following the same signs we will arrive again at Ripoll, to cross the Riu Ter and arrive by the greenway to our destination. Recommended route from spring to autumn. In winter we will find many areas with ice and possibly with snow in the highest areas. Tour without any technical difficulty. We can also follow the plates of the “Route nº20 of the Centre BTT Ripollès (MTB center)”. We will start the route in the Pavelló de l’Avellaneda, and we will go to Ripoll along the Via Verda (greenway). We will cross the town by the Passeig de l’Estació until we find the bike lane next to the road that will lead us to Can Villaura, where we will cross the road through a lower pass. We will go to Les Llosses road and carry out a short section of no more than 500m, with caution, until we find a detour to the right, by cemented path and initially strong rise, which shortly afterwards softens. Before arriving at Can Mir we will enter the dirt road, and we will make a comfortable fairly flat area protected by trees, until we find another turn to our right, this time uphill, which we will not leave at any time, with some sections with more slope than others, until arriving at Ca l’Auró, the farmhouse that gives name to the route. At the highest point of the route it will be well worth a short stop to enjoy the views of the forests that surround us. Nearby we will find a vertical sign and we will take the path on our right, which will gently lead us to another junction, also on the right, starting the descent. This will be done initially through a stretch of forest, until you reach Sant Feliu d’Estiula, a well-known hermitage in the area. We will pass by the side and go to a main track, which always downhill and parallel to the Torrent de la Cabana, will leave us at the Camí Ral de Gombrén to Campdevànol. At this point we will turn right, and through a very comfortable area, we will arrive at the entrance of the town. Not leaving the Camí Ral we will turn to the right, always next to the Riu Merdàs, until we find a concrete walkway that we will cross and we will start the last uphill sector, until the Coll d’Estiulella, from where almost always downhill, we will arrive at Ripoll by the leisure area of ​​the Font del Tòtil, and then, by asphalt, we will enter the streets of the town that will lead us to the starting point of the route. WATER.- All the services in the Pavelló de l’Avellaneda / Campdevànol (km 25 approx) / Font del Tòtil (km 31 approx) / We will find different streams where we can freshen up. Recommended route from spring to autumn. In winter, in addition to the cold, we can find some frozen or snow areas. Tour without any technical difficulty, with a lot of stretches of cement. We can be guided by the signs of circuit nº2 of the Centre BTT del Ripollès (MTB center). We will start the tour in front of the Pavelló de l’Avellaneda, and we will make the first meters on the greenway, towards Sant Joan de les Abadesses. Just passing under the road, we will see a path that we will continue straight, and this will leave us on a forest track that we will follow to our left. It will begin to rise steadily, without any difficulty. Once we crown a small pass, the same track will take us down until we find the Vallfogona del Ripollès road, which we will follow for about 500m, until we find on the right the detour of Llaés, and a few meters later we will see a small path on the left, parallel to a fence of cattle, that in soft descent, and after some short technical sections, it will take us to a cement track. Arrived at the cement track, we will turn left, and in ascent, we will arrive again at the road of Vallfogona del Ripollès. This time we will only make a few meters on it, just enough to cross the bridge, and we will turn left to find again the cement track, which in constant rise without loss, and always by the main track, will lead us to the highest point of the route, the Collet de l’Esquirolet, next to a farmhouse, and begin the descent, following the same track with caution on the weekend because is a busy track, and will lead us to Sant Joan de les Abadesses. We will cross the town following the track, by the Pont Vell, to go up to Alberg Ruta del Ferro. At this point we will find the greenway, and on the left and always with a tendency to descend, will lead us without any difficulty to the point of departure. Recommended route from spring to autumn. In winter we can find snow punctually in the highest areas. We will take care especially on the cement footbridge of Campdevànol, after heavy rains the water of the Merdàs river can pass over. Spectacular beech forest during the ascent to Sant Julià de Saltor. We will start the route in the Pavelló de l’Avellaneda, and we will cross the town to the cement road of Can Jordana. Shortly after we leave the cement to enter a dirt road, which shortly after begin to rise, without difficulty and by a wider path, to Campdevànol, where we will arrive to the Barri de la Creu after crossing the Riu Merdàs. 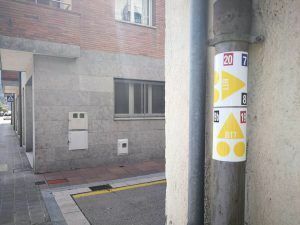 In the same neighborhood we will take the Camí Ral, which will lead us to the entrance of the town, which we will cross diagonally through its streets until we reach the national road. In this sector we will make about 2km along the road, always driving on the right with caution, and after the Pont de la Cabreta, full of history, we will find a track that starts on our right. At this point we will start the most demanding climb of the route, where will be won height without truce, with good views, and where in its second half we will cycle through an impressive beech forest, very shaded, where we will find a fountain. We crown the Coll de Saltor, the highest point of the route, and we will see in front of us the hermitage of Sant Julià de Saltor, the Collet del Vent and the imposing Sant Amand, which with its 1851m dominates the area. By a way well marked we will circumnavigate the farmhouse and cross a yarn of cattle to our left, to begin the descent, which, like on the climb, will lead us to the Gorg de l’Olla, after passing through Mas Maiols. At the gorg we will arrive after a sharp turn to the left, and there we can refresh ourselves. After the gorg we will enter a path to our right, mostly flat and that will require some technical skills, and always by obvious path, will lead us to Coll de Comallevosa, where following straight, we will face the last climb of the route, short but intense, especially in the last section broken by the inclemencies of the rain. 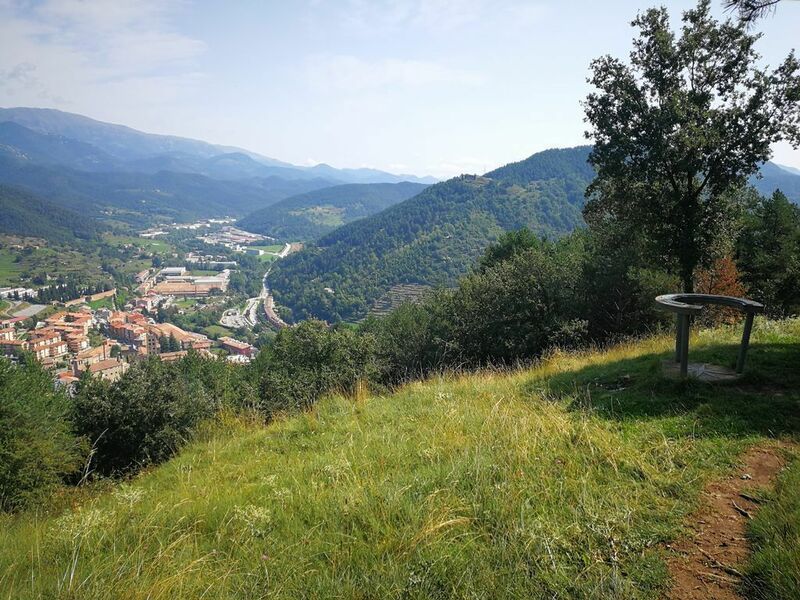 Once crowned Sant Roc, we will enjoy spectacular views of Ripoll and the peaks that surround it, and we will start the last descent for a fun path through the forest, that between trees will lead us to the Camí Ral after passing next to La Querola, a farmhouse in ruins. From Camí Ral, without any loss, we will enter Ripoll and return to the starting point through its streets. WATER.- All services in the Pavelló de l’Avellaneda / Services in Campdevànol / Fountain in the rise to Saltor. We can refresh in the Gorg de l’Olla, already descending. Recommended route from spring to autumn. Spectacular views from Pla de la Tomba, where we will dominate the entire Riu Freser valley, and the peaks of its head, from the Taga to Puigmal. Very fun circuit with some technical trails. When raining we will pay special attention when crossing the cement walkway over the Riu Merdàs. 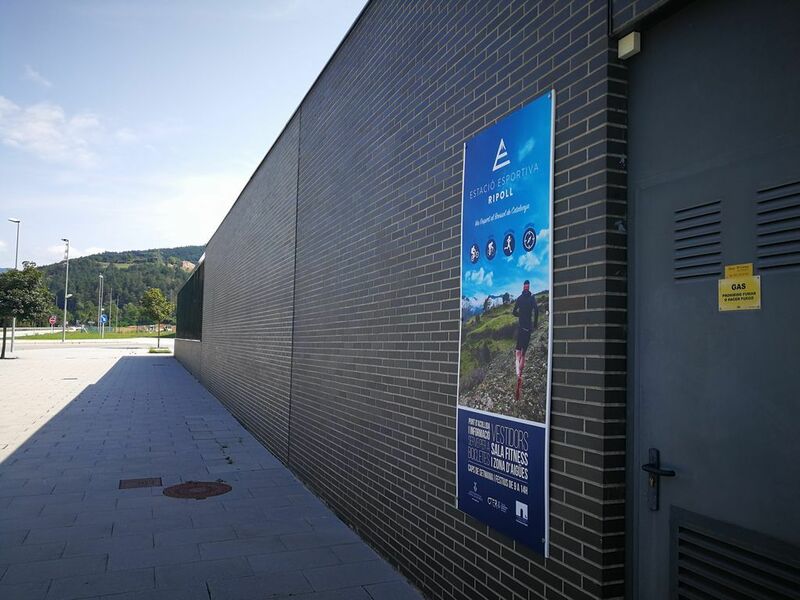 We will start the route in the Pavelló de l’Avellaneda, crossing Ripoll behind the Monastery and we will arrive at Campdevànol by the Camí Ral, without any technical difficulty. 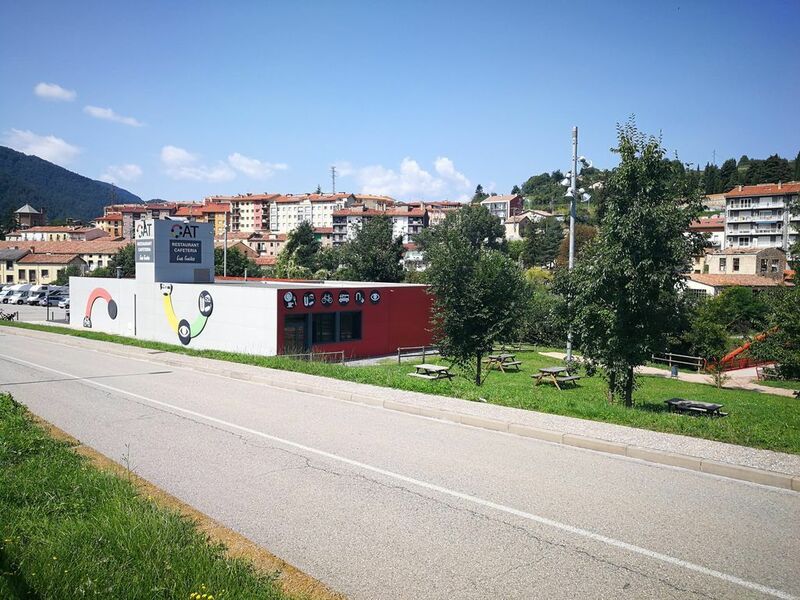 We will pay attention when leaving to the highway, and we will cross Campdevànol direction to Gombrèn, until we find the the train track and, in ascent, we will enter the district of Vista Alegre. Following the street we will leave the asphalt and we will find the dirt track, at first flat but later in progressive ascent, will lead us to the Hermitage of Sant Pere d’Aüria, always under the protection of the forest. Arrived at the chapel, we will turn left and make a beautiful loop that will return to this point after passing through the Pla de la Tomba, spectacular viewpoint over the Riu Freser. At this point we will arrive by path, with some technical section, and we will find the meadow, where we will look for the path, very funny and entertaining, that will give us back to Sant Pere d’Aüria. Back to the hermitage, we will undo a short section of the track that we have made uphill, now downhill, to Coll de la Batalla, where we will find the GR (red and white marks) and we will face a strong, short and intense, that once surpassed will leave us in a nice path that will return us again to Campdevànol, always in descent and without technical difficulties. Once again next to the train track, this time we will not cross it, and we will continue straight on asphalt to the Creu neighborhood, where we will cross the Riu Merdàs by a cement walkway, and then we will start the last climb of the route, progressive and without difficulties, after which we will start the descent that will bring us back to Ripoll, with the last stretch of cement, before entering the urban nucleus to cross it and finish the journey at the same point where we started.